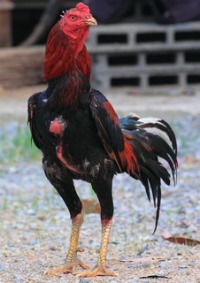 The relatively rare Malay Chickens are the tallest chicken of all breeds, with roosters standing over three feet tall. Size: Standard Male: 9 Ibs. / Standard Female: 7 Ibs. / Bantam Male: 44 oz. / Bantam Female: 36 oz. Comb, Wattles & Earlobes: They have a small to medium-size strawberry comb that is set well forward on the brow. They have very small wattles and earlobes and all are bright red. Color: Unless otherwise noted, the beak is yellow, the eyes are pearl, and the shanks and toes are yellow. Black: The beak is dark horn and the shanks and toes are a dark horn to a dusty yellow. They have standard black plumage. Black-Breasted Red: They have standard black-breasted red plumage. Mottled: They have standard mottled plumage. Red Pyle: They have standard red pyle plumage. Spangled: They have standard spangled plumage. Special Qualities: Tallest of all chickens and rare. This breed is very old and originated in Southeast Asia. It is known for being the tallest of all chickens and the roosters can stand over three feet tall with a long neck and giant legs. The breed is also known for their "beetle brow," which gives them the appearance of being mean and staring you down. This is actually a bone projection over the eye. The feathers are tight and hard, lying close to the body. Despite their angry appearance, these birds are actually rather calm. They are slow to mature and active, not doing well in confinement. The hens can go broody and are good mothers, but they do not lay very often. The breed was first admitted to the APA in 1883.